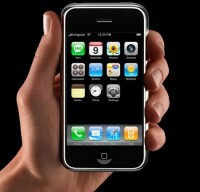 I love the look of the new i-phone and in honesty WANT one. Why? Well it is cool, neat, trendy, has oodles of tools, applications and functions. All this justifies why one should be in my pocket. Or does it? My current phone was chosen because it does the job well – it is a Nokia 6300 and works fine. My previous phone had bags of functions but they were rarely used and the phone sucked as a result. So why would the iphone alter my previous trend of thought? Put simply…..greed, I want the best so that I can boast and brag. I have no issues with others that have them….this is my personal issue and it drives me mad. I do not want to be greedy, jealous and in need of prosperity – yet in truth I still WANT the latest gadgets and best of the new thing. I will resist the urge to splurge (cos I have no spare cash, probably!) but my mind still has a lurking green monster – if only it could be crushed. This years ‘must have’ is often next years ‘dinosaur’ and from what I hear the i-phone locks you into loads of apple proprietary systems so they can fleece you of even more of your hard earned cash! Yeah but with a MacBook already, my new iPhone works great! Takes a bit of getting used to and there’s a few bugs but the versatility is brilliant – especially the internet. I’m the same though about spending, I always want the latest stuff (just ask my wife)!